This cabin is a hidden jewel. If you like to sleep with the sound of a creek, then this is the place to be. Covered back deck with hammock in view of the woods and the sound of the creek, can be used all year round with an outdoor fire place. King bed & full bath on the main floor. Upstairs bunk bed room, full bath, & queen size bedroom with private balcony. The cabin is 10 minutes from the small city of Clayton. Stroll down main street, explore the nice shops and eat from burgers to upscale restaurants. Highly recommend Fortify Kitchen & Bar (make reservations 2 weeks in advance) as well as The Joint which features local musicians. Cabin is also 25 minutes walk from a beautiful waterfall with a natural swimming pool as seen in photos. In response to the review mentioning the mice, we hired ARROW to thoroughly seal the house from any wildlife last month. My wife and I purchased this North Georgia property in 2004. My wife has since passed away but she adored it and we spent a lot of time up there with my two kids. It is a great hide out and a jewel of a place to just relax, walk down the country lane, or go out on a hike on the many mountain trails. In renting out the cabin, we are sharing her legacy with others at a modest price. Nestled in serene woods next to a babbling creek - has a lot of walking trails and a 40 foot water fall 15 minutes walk from the cabin. 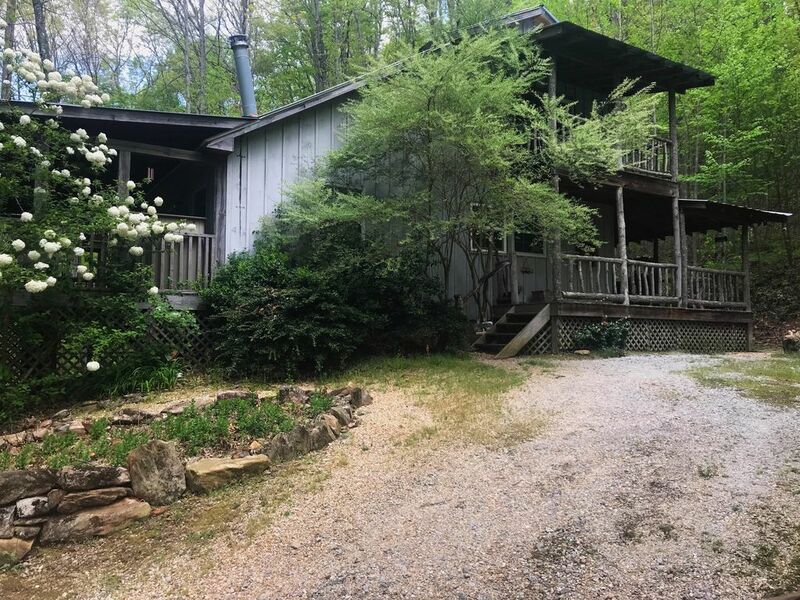 Pretty views, hammock, lovingly decorated, hiking trails, cool creek, quiet surroundings. Timpson Creek also know as Rainbow Creek runs along the property with a private access and a 5 ft rock slide that my kids love.The water is ice cold as most creeks are - but has not stopped my kids from swimming in it. There is also a 45 ft waterfall 25 minutes walk from the cabin. all you need - don't have to bring anything with you - just groceries and your good to go. over 75 movies to choose from - choices for the entire family. 45 foot waterfall at 25 minutes walk from the cabin. Our two families have been renting a couple of cabins a year for a while now. While we have always had good owner experiences, the owner of this cabin has been the quickest and most conscientious responding one. He is definitely interested in making sure you enjoy your time. Would definitely go back. Also, skip Walmart and go to Ingles grocery store. Great selection. Adorable cabin away from city life. This adorable cabin was exactly what we needed. Near downtown Clayton. Wish we had hot water. Let us know when it gets fixed. Hot water is up and running - had a temporary malfunction with water heater - all perfect now! Lovely property, well kept, beautifully decorated, very reasonably priced. Felt more like a home than a rental. Good central location! Saw some beautiful sites of nature. I prefer the security deposit as a personal check that I hold on to and then destroy after I get the all clear from my cleaning services. That eliminates the complication of refund afterwards.